3 Video projection 20', 5 min. One Eye Open is the conceptual inversion of Pascal Grandmaison's previous work Soleil différé, completed in 2010. The film shows a bouquet of artificial flowers that seem to come to life. 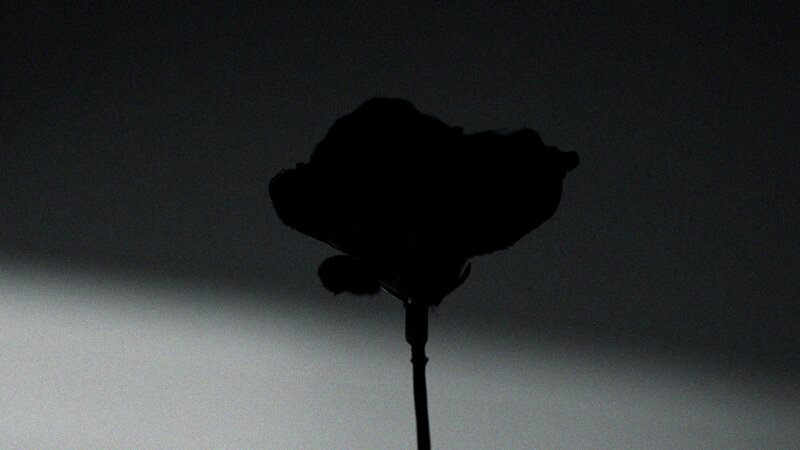 The flowers are animated by using the cold and "commercial" binary light (studio flash for fashion photography). Shot in stop-motion animation, the film contains more than 9400 juxtaposed photographs that were needed to produce the movement. Grandmaison took 24 pictures per second, then for each five or six shot moved the lighting set up in the studio and also moved the camera a few millimeters for each shot, to create a monochrome strobe that shades the limit between reality and the unconscious. The juxtaposition of images deepens the viewer within a perceptual field that could be best described as a fantastic realm of fell, dormant reality. The visual construction of these permutable frames questions our memory’s capacity to compound an archive of the seen. The specific manner used by the artist to illuminate each image results in an impression of luminous frenzy: as Grandmaison says, “A change in illumination that one can observe on the petals of the flowers takes place 24 times per second.” This technique has allowed the artist to balance the dichotomy of the natural and the artificial so as to unveil the mechanical movement that gives an impression of life on the flowers. 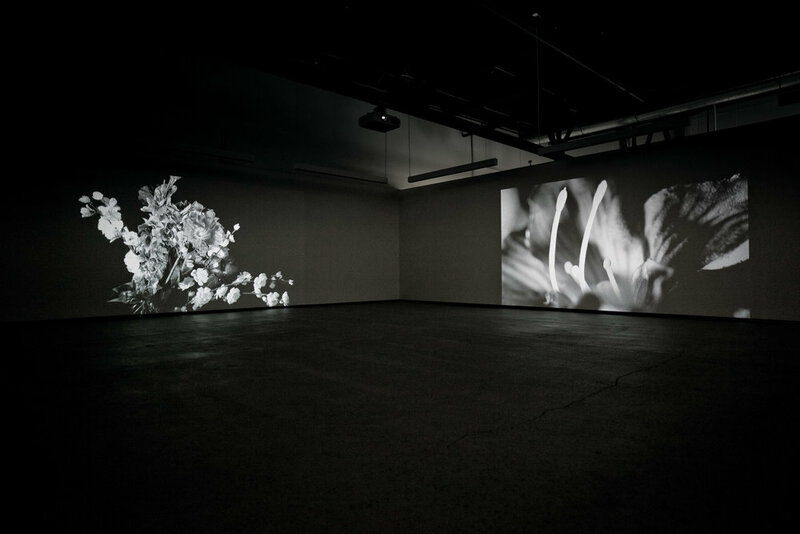 Staccato sequences of silent close-up shots describe the arrangement of polyester flowers, as the interplay of light and shadow marks the artist’s ability to convey technical acuity into dreamy unconsciousness. The play of light and the artificial creates an almost romantic void where elements are not to be decoded, but seen through their perfect illusion. The artist’s intent is not to articulate a discursive position, to create the explicit image of a thought; instead, Pascal Grandmaison counters hyper-realism with an intuitive, subjective explanation of phenomena. Like in Soleil différé, One Eye Open looks at the particular effect a source of light produces upon a specific environment. Yet if in Soleil différé the artist made reference to Modernism and its aspirations to fulfill an era of technological progress which has fastly degenerated, in One Eye Open the viewer is only given to see interrupted moments during which our perception and interaction with light and the illuminated artificial flowers is defining for the way light disseminates into space and affects our perception. Light takes the form of a hallucination Grandmaison investigates by using the video as a critical medium. The apparently melancholic tone grows as the images quickly switch to one another, unraveling that which is evasive and invisible. Our gaze seems to never see the whole picture – a thesis the artist uses to question ‘representation’ and the immediacy of the real. Like the interplay of artificial light and artificial nature, absence and presence compete here as the constitutive structure of the image that the camera cannot fully capture. The movement in One Eye Open is rapid and nervous, the rhythm oscillates continuously. The reversals transform objects and the event of seeing into unwilled sculptures of the real and unwilling actions, as if the artist would fictionalize the real. The imaginary event thus depicted is defined by an unsolvable paradox – the image depicts the unimaginable, the unconceivable, and the unseen. In doing so, Pascal Grandmaison looks at the failure of imagining technologies and the ‘error’ that lies deep within the very image to capture the continuous transformations and identifications between subject and representation. The artist’s criticism of the artificial mechanics of both nature and lighting is an inherent criticism of technology’s claims to objectivity: while the close-ups expose the mysteries of this artificial environment and seem to look at the plastic flowers as objects of knowledge, there is a disjunctive rest the camera cannot capture. The images describe the movement of ghostly impressions and trace the camera’s partiality, thus allowing the viewer to contemplate the rift between the objectification of the real and its subjective perception. By using this phrenetic rhythm, Grandmaison also addresses a critique of the representation of still life and its exaggerated constructions. Still life becomes animated still life, emphasizing the moving fabric of the real and aspects relating to the fallacies and idola depicted in still life. All appearances of great romantic images reveal our deception and dissatisfaction with the artificiality of this environment. Through all the ‘deficiencies’ and ‘defects’ of the artificial flowers in Grandmaison’s One Eye Open, the unsuccessful attempt to represent the real challenges our expectations over what is real and the pursuit to subject nature to an all-seeing, technologically mediated human view. The mechanical pulsation and reanimation of all the leaves, flowers and stems enters a dialogue with the transparency normally associated with vision to reflect the opacity and negativity of the gaze. Paradoxically, it is by means of rhetorical non-images that the viewer is invited to reclaim the unimaginable – in order to see, one needs to capture the partiality and finite character of perception. The image unveils its constitutive incoherence in between the inner and outer realities that define the process of seeing and the constitution of the image: it is seen with one eye only, eely and slippery.